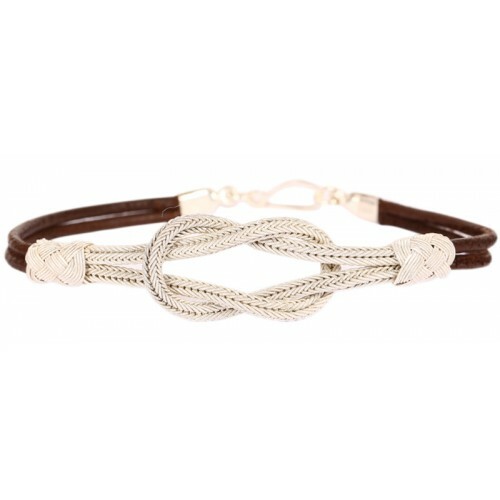 Kazaziye knot silver bracelet is designed and hand-made by the artist Funda Yapıcıoğlu. Kazaziye which is a silversmith technique particularly exclusive to Trabzon city is thought to have been inherited to the Anatolian people by the Lydian, who dominated in Anatolia during 2800 BC. It is 100% hand-made with silver threads preparing by means of twisting 0.08 microns of silver wires with a fineness value of 1000 on silk thread. 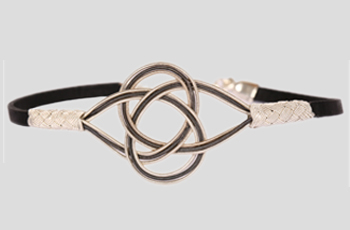 Material: Silver with a fineness value of 1000, leatherDimensions: Length 16 cm. Funda Yapıcıoğlu who is an artist from Trabzon has been applying “Kazaziye” jewelry making since 10 years. Kazaziye is a silversmith handicraft exclusive to Trabzon city, which is thought to have been inherited by the Lydian dominated in Anatolia during 2800 BC. By modernizing the traditional one, the artist designs her 100% hand-made endings and makes them convenient for daily use.